Increasing Core Strength is the only way to achieve quicker bat speed, and he only true way to maintain the power. The Torso is a combination of abs muscles, back muscles and shoulders working in unison, to create a powerful upper body. This strong upper body allows for the explosive opening of the hips and the ability to initiate a lighting quick bat through the strike zone and the strength to either fight off or pull those inside fastballs which explode into the hands. For this exercise begin by laying flat on the floor, face down. Bring your elbows along the sides of your body, bend your toes. Raise yourself up on your elbows and the balls of your feet, keeping your body a straight and rigid as possible. Tighten your muscles keeping your buttocks from either sinking or raising. Keep your body as straight as possible, like a plank of wood for 10 seconds. As you become stronger increase the times to 20 - 30 - 40 seconds. This exercise is exactly the same as the basic plank, except once in the rigid plank position, instead of maintaining complete rigidness, you will lift your right leg upwards and hold for 3 seconds, then lower and lift your left leg for 3 seconds. Continue to alternate until finished. Side Plank: Start this exercise lying on your side on the floor. 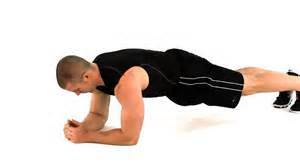 Lift yourself up on your right elbow, then straighten your entire body as if a plank board from the head to the feet. Extend your left arm upward, holding this position for 5 - 10 - 30+ seconds. Repeat for the opposite side. I hate listing these because I hated them as a player, but they worked. Full vertical crunch begins with lying flat on your back on the floor or mat. Lift your legs upward keeping them as straight towards the ceiling as possible. Cup your hands behind your head. Tighten your abs and lift your upper body, holding that position as long as possible before relaxing your head back to the floor. Be careful not to pull on your head, straining your neck as you perform this drill. Bicycle Crunch begins with lying flat on your back on the floor or mat, Cupping your hands behind your head, do not pull, lift your head off the floor. As you do this, bring your knees to your stomach, then extend your left leg outward, while turning your right side of the body towards your left leg. Alternate the legs going back and forth at the same time the alternate elbow goes towards the leg. Naturally the foundation of the entire body is the legs. Strong legs are essential for increasing bat speed, as well as benefiting other aspects of the game. Squats and Lunges are still the best method of building powerful legs. Bear in mind when I discuss “Power” I’m not necessarily referring to looking like a fireplug. Long, lean muscles are extremely strong. This is an excellent exercise because it’s a multi - joint and multi - muscle builder including the glutens, thighs and hips. Let’s look at a few simple squat exercises which can be utilized without a gym or expensive equipment. For this exercise hold a dumbbell in each hand. The amount of weight will depend on your strength, but let’s push the envelope. These weights can be held at the sides, thigh high or above the shoulders as if it were one bar. Begin with your feet spread shoulder width apart or slightly more. Keeping your back as straight as possible lower yourself until your knees are at a 90 degree angle to your hips. Hold for a second or two, then slowly lift yourself straight upwards while maintaining a rigid back, strengthening your core muscles as well. Perform 1 - 4 sets of 8 - 10 reps each. Remember to keep your toes in line with your knee to prevent straining or twisting the knee. This variation of the standard squat works the inner thigh more than the traditional squat and will give your greater flexibility. This exercise operates from a completely different stance. Standing, point your knees outward, toes following the knees’ direction. Either hold a dumbbell in each hand, resting on each thigh, or a single bar and weight behind the head on the shoulders. Slowly lower yourself until your hips are at a 90 degree angle or until your flexibility stops you. Your knees and toes are opened wide and are pointed at @ 30 - 45 degree angle. Hold this position for 5 - 10 seconds then raise to starting position. This exercise not only builds leg muscles, but also promotes hip flexibility which is very important for allowing the hips to be able to explode quickly as you accelerate your bat speed. Finally, we’ll work on our forearms, hands and fingers, which all work in conjunction with one another. There are several quick ways to strengthen the hands and fingers, some as Simple as squeezing a tennis, squeeze, or racquetball. These balls are small enough to wrap your hand and fingers around and squeezing will greatly increase finger and hand strength. Hand held exercisers perform the same thing. For this exercise either buy an apparatus designed for this exercise or make your own. It involves a bar, which you can hold with two hands, cord or rope strong enough to carry the desired weight, and the desired weight with the roped threaded through and secured. Standing upright and holding the bar out in front of you, begin winding the weight up by twisting the bar and wrapping the rope around it. When the weight is completely raised, slowly unwind the weight back to the floor. These are a simply sampling of core strengthening exercises you can implement and it doesn’t matter whether you use these or others which serve the same purpose. The important thing is you understand there’s no magic wand for increasing bat speed. Only good old fashioned hard work.